And now, instead of wasting my time thinking up things for Mr. Postman (whom I don't truly hate- it is more the system that anything else that is annoying me) (why can't we just beam things around, like on Star Trek??? )-I am thinking up things for my next secret swap- the Funky Scarf Swap. At first, I thought I would try something from "Scarf Style"- I went here for some inspiration- http://www.interweave.com/knit/events/scarfstyle/scarfstyle_winners.asp. Then I asked friends for some of their ideas. I won't say what they were, because when I asked Becky (http://knitting-interrupted.com/) what she thought, she confirmed my definition of tacky. And that's about as far as I am going to go with that! Soooooooo- I started this one- from "Scarf Style" I adore this scarf. 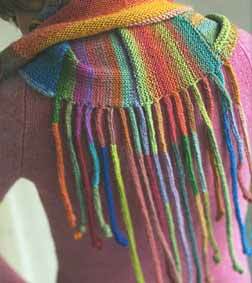 I don't have the tons and tons of Paternayan yarn that is called for in this pattern. But I DO have quite a bit of odds and ends of Starmore yarns. (mostly Campion) But what I need is a brighter palette from which to choose. To make the scarf really "sizzle". Then I played around a bit with some Anne yarn (by Schaeffer)-I will have to add that picture later, since blogger won't do it right now. And tossed that in the "not quite right" pile. And I ended up with something that I think will be very sharp-and I will reveal it when the time is right! I just love that book. So many great inspirations. PS: Deb... here's the International Scarf Exchange I was telling you about, if you're interested.